We traded in a car recently and received a good-sized check back from the auto dealer. In this particular case, we deposited the check into our brokerage account. This is a large national brokerage firm with a local office, and we made the deposit in person. It turns out that this office puts its deposit checks each day into an overnight envelope which is then sent to the brokerage's admin office. There, the checks are processed and deposited into the individual accounts. At first glance, this procedure seems reasonable enough and not so different from what many banks might do with remote branches. The similarity ends there though, as it turns out that no copies were made of the checks and no stamp put on the back. These checks went out the door with only the endorsement of the customer on the back. Given this build-up, you won't be surprised to learn that the courier service lost the envelope without a trace and all its contents. Given the stack of endorsed checks inside, depending upon the sophistication of the finder of the envelope, it's the equivalent of finding an envelope stuffed with dollar bills. There are a multitude of lessons here. First of all, deposit all of your checks in a bank and avoid this problem. Second, trusting check processing to anyone other than a bank, even a highly respected national brokerage firm, opens a depositor to far more risks it would appear. Third, measures that would seem basic and minimal in a bank may not be part of the deposit process in a brokerage branch. Finally, if it is this bad at a major brokerage firm, we can only imagine the lack of procedures in some of the "new age" non-bank providers of financial services. Banks with remote branches may well be sending checks back and forth by professional couriers, whether they use small independent companies or the big national ones. In spite of all the tracking numbers on envelopes and packages that we routinely note when awaiting presents from Amazon, there are cases when packages are simply lost. Chances are that your bank has considered what could happen if a courier package was lost, but it's not a bad idea to review those procedures. The use of couriers has become so common it feels outside the realm of possibility that something could end up not just delayed, but truly lost in transit. Clearly nothing should ever be sent without maintaining a copy in the original branch. 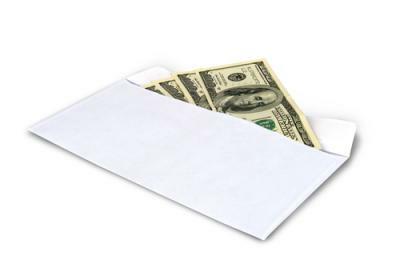 The biggest national couriers could cover the loss from stolen checks, but we wonder about smaller ones, so consider carefully when choosing who works for you. Risk management is only as strong as the weakest link in any chain and that chain includes the organizations that your bank uses to do tasks for you. Regulators are paying close attention to the organizations that provide outsourced services in their assessment of banks' enterprise risk management plans, simply because banks have become so dependent upon outside providers. Lost interoffice packages may not come to the top of the risk in that they mostly concern internal documents, but they can impact customers too. Closely monitor any vendors that deal directly with customers (like providers of internet sites, card or ATM services), or could have a significant impact on your bank. In the case of this lost check, going back to the car dealership to have them put a stop-payment on the original check and asking them to re-issue it, clearly created customer impact. For its part, the brokerage office explained that this had never happened before, an explanation that we didn't find to be particularly comforting. The business of banking is the management of risk and therefore is in essence, preventing things that have never happened before. Take this moment to review what you do in your bank in the management of all your vendors to avoid an issue like this down the road. Treasury yields rose on the short end of the curve to reflect the Fed's likelihood of raising short rates later this year. Housing starts, building permits and consumer inflation will occupy the markets. 1) American Riviera Bank ($230mm, CA) and the Bank of Santa Barbara ($182mm, CA) have agreed to merge for $15.4mm in stock (100%). After the combination, American Riviera shareholders will own about 62% of the stock and Bank of Santa Barbara shareholders will own 38%. Fed SF President Williams said he thinks rate hikes should happen this year and a Sept timeline is plausible. Research by travel and expense firm Certify that looked at business traveler transactions across the country finds: 55% of all rides were with Uber (vs. 18% last year) and 43% of rides were in taxi cabs. Meanwhile, the top 5 most expensed restaurants for meals were Starbucks, McDonald's, Subway, Panera Bread and Dunkin' Donuts. Fed research finds the average small business has 8.6 employees, 90% of small companies have less than 14 employees and the median small business had only $80k in sales. SNL Financial reports the average price to tangible book of the 73 deals announced in Q2 was 1.37x vs. 1.42x in Q1 and 1.38x in Q2 2014. The FBI suggests banks take the following actions to protect themselves against insider thefts of intellectual property: educate and regularly train employees on security or other protocols; ensure that proprietary information is adequately, if not robustly, protected; use appropriate screening processes to select new employees; provide non-threatening, convenient ways for employees to report suspicions; routinely monitor computer networks for suspicious activity; and ensure security (including computer network security) personnel have the tools they need. FDIC data shows the total number of institutions has declined 23% from the end of 2007 to the end of 2014 (8,354 vs. 6,509). Despite the decline in numbers, assets in the industry have climbed 19% (from $13.0T to $15.6T). Countries with the largest number of banks in the top 100 by total assets (as of 2013) are: China (17); USA (10); Japan (8); Germany (7) and the UK (6).